Once upon a time, in a land far, far away, there lived a merchant with his two daughters. The eldest daughter was spoiled and vain, and the youngest preferred to read all day. She was so pretty everyone called her “Belle.” One day, the merchant got lost in the forest and stumbled upon a castle that looked enchanted. Suddenly, he stood face-to-face with the castle’s sole inhabitant: a beast! The Beast would spare the merchant’s life on one condition: he must send one of his daughters to live in the castle. Against her father’s will, Belle went to the Beast’s castle…. 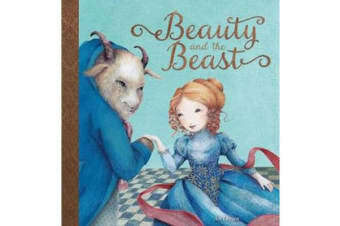 The cheerful Belle and the good-natured Beast come to life in this beautiful picture book by An Leysen. For everyone who loves timeless fairy tales.